Anytime I go somewhere new I look for bakeries and cupcake shops. It has become an addiction for me and is often the first thing on my mind when I plan a trip. I’ll drive, walk, or bus just about anywhere to get my favorite dessert, and my recent trip to Cape May, New Jersey was no different. 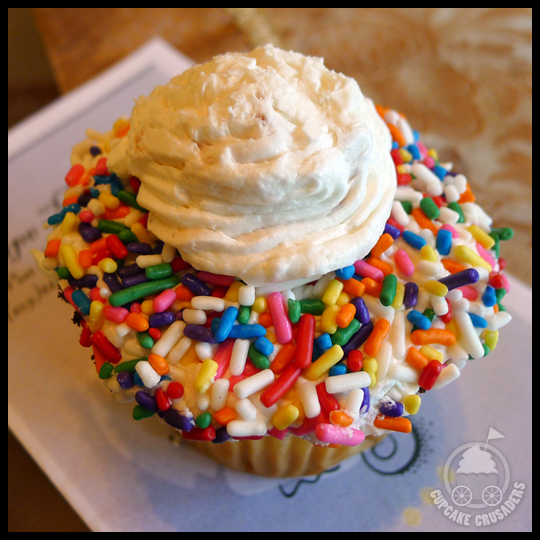 After doing a little research (we Crusaders LOVE researching just about anything) I settled on two cupcake stops while in the area: Ellie’s Cupcakes and Cape May Bakers. Sadly, after walking over to Ellie’s Bakery, they were closed. 😦 I read the hours wrong online and they were closed the only days I would be in town. 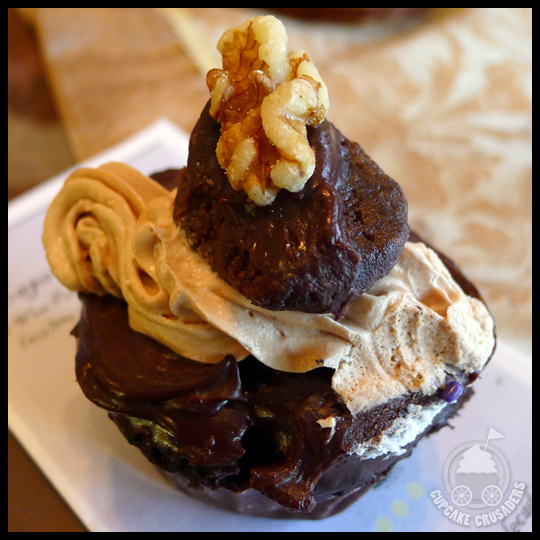 Cupcake Crusader Fail. Lucky for us, Cape May Bakers were open and just a short walk away. (Actually, everything is a short walk away in Cape May, it is such a quaint and cute little tucked away town.) The shop was small with a few tables decorated in the signature Cape May Victorian style. They offer coffee and tea, breads, pastries, and even lunch specials including quiche, salads, and soups. I picked two cupcakes, of the four flavors they were offering that day. Vanilla is not a flavor I order a lot, as it is a little “boring” for my taste, but the addition of sprinkles made this one irresistible. Sadly, I was again disappointed. The cake was very dry and neither the cake nor the frosting had much flavor. The texture of the frosting was smooth, but paired with sub-par cake, together they still created a mediocre cupcake. This entry was posted in Cupcakes and tagged Cape May Bakers, Chocolate caramel, cupcakes, Ellies Bakery, vanilla by Crusader Elisa. Bookmark the permalink.